IGM-PH, an affiliate of Richwell Phils, Inc., is having its warehouse sale of well-known infants' and children's brands. 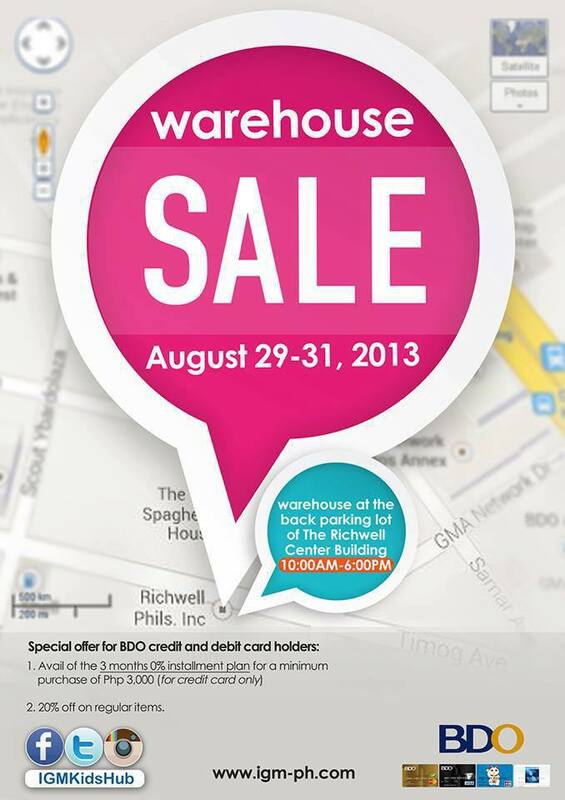 Warehouse sale starts tomorrow, August 29, till Saturday, end of August at the The Richwell Bldg, Timog Ave.,Quezon City (in Front of Caltex Gasoline Station, Near GMA7). Prominent brands Pigeon, Safety 1st, Chicco, ERGO Baby Brands like, are up for grabs at a discounted price. Items on sale to name a few are: Strollers, Cribs, Baby Car seats, to fashionable clothes for your kids and loved ones. If you're looking for that ultimate deal but still getting quality and branded items, then this is it. May it be for personal use, gift or giveaway this is the perfect time to shop and save! to a 3-month installment plan for a minimum purchase of PHP 3,000.00. No BDO credit/debit card, no worries. You can still use have the ability to swipe your card and make a straight payment. Thanks Mr. K. Maceda for the details.